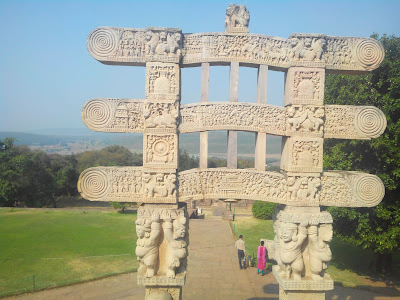 Sanchi - located about 40km North-East of Bhopal - is a site of immense importance for the Buddhist sect in India. The main attraction here is a simple hemispherical stupa from the Ashokan era that houses the relics of the venerable Buddha himself. Scattered around this monument are about 50 other monuments of varied significance - temples, monasteries, pillars - all associated with the Buddhist sect. In line with its immense cultural significance it has been conferred the status as a UNESCO World Heritage Monument. 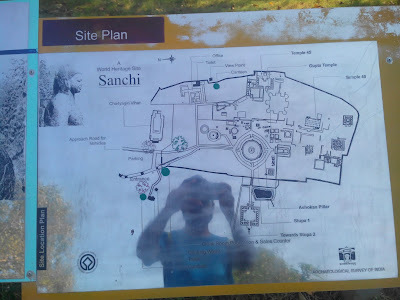 Sanchi is best approached from the city of Bhopal. There are enough road and rail services available between the two places. The public bus options are available every 10-15 minutes, while the train frequency is pretty less. Bhopal is well connected to places all over India by road, rail and air. The stupa complex is located on a hill at a distance of about 1km from the main road-head. Rickshaws are available for the short climb to the top, while the ones who prefer walking may take the stairs. There are a few peacocks and langurs in the woods that cover the lower sides of the hills and walkers may sight a few. The monuments of the complex are numbered 1-50. A sitemap is available near the security counter. Free information booklets are also available here on request. 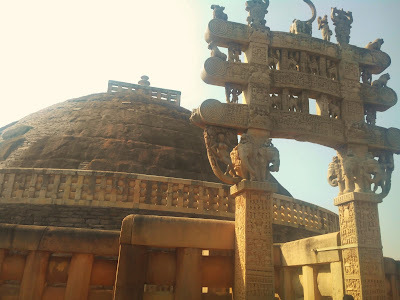 The center-piece of the complex - Sanchi Stupa Number1 - stands straight ahead. Other stupas of a much smaller size surround the main stupa, beyond which lie the older temples and the monasteries. 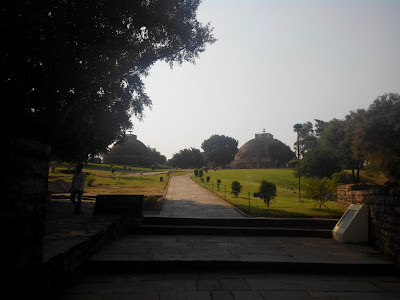 A stupa complex and the Sanchi Stupa Number2 are located at a distance to the west and at a considerably lower level too. 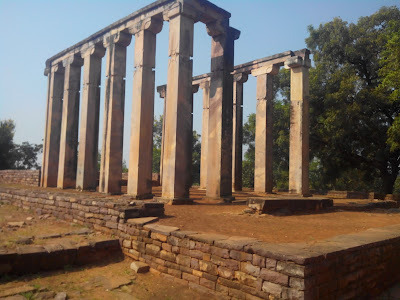 This is the main monument of the Sanchi complex - believed to house relics of the venerable Buddha himself. This is also known to be the oldest stone structure in India, built by the emperor Ashoka himself during the 3rd century BC. The main dome of the stupa is surrounded by a raised ambulatory path accessed by a dual stairway to the south. The top of the stupa has a distinct three-tiered chhatri (mushroom) that distinguishes it from other structures. An outer enclosure surrounds the stupa and is punctuated by richly carved torans (arches) in the four directions. 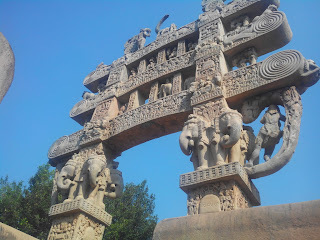 The northern toran is the most elaborate of the lot with the lunar depiction at the top rung being my personal favorite. To the south-east of the main stupa lie the remains of the Ashokan Pillar. The pillar was made out of a finely polsihed sandstone monolith, capped by the Ashokan capital of Four Lions. The free standing pillar was intact until a few centuries ago when it was felled at the orders of a local zamindar. The remains of the pillar are kept under a shack while the capital is now kept in a museum. 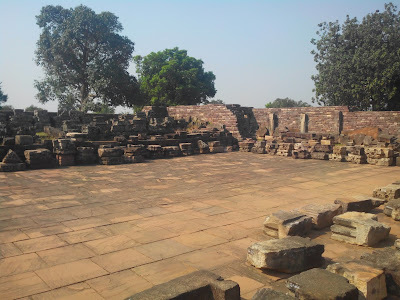 The complex of Sanchi is scattered with monasteries and minor stupas. The monasteries - largely orthogonal structure give an idea to the organization and daily life of the monks that once lived there. The structures are simple, but well organized. 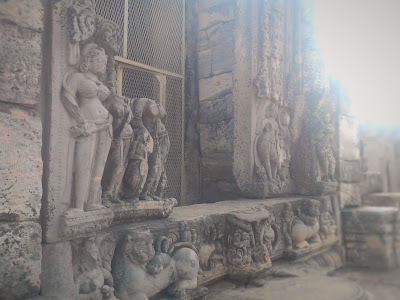 A few temples from later periods are also seen. Two modern buildings now complete the complex. The Marshall House was the accommodation of Sir John Marshall who supervised the excavations and restoration work here in early 20th century. The house is now a museum displaying his collections and works. 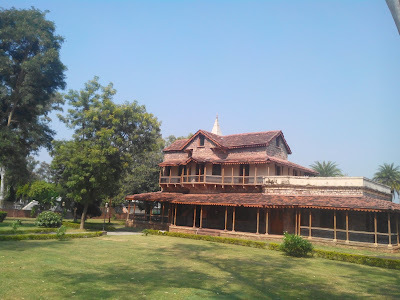 The Chaityagiri Vihara was built in the post-independence period and houses the relics of Buddhist masters which have been returned after the end of British Rule in the subcontinent. 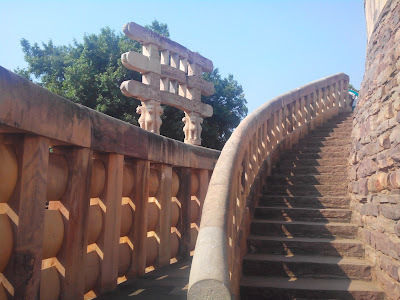 The Sanchi Stupa is a good place to visit even for someone with a casual interest in history. 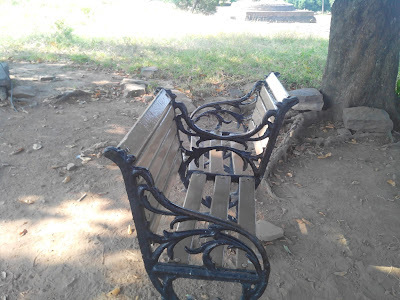 This post has been rewritten after my second (more casual) visit there. The early mornings and late evenings are best times at the site - very peaceful! 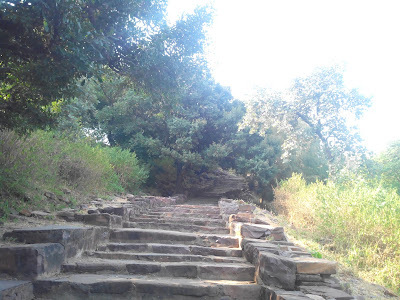 While there, one can also pay a visit to the Parmara-Gupta monuments around Vidisha a mere 15kms away.